This may sound like a silly question, but I've been wanting to know for a while now. (As I'll probably never get to find out the answer for myself, by actually visiting Windsor Castle, this is the only other way I have of learning what I seek to know.) Can anyone tell me what floor the State Rooms and the Semi-State Rooms are on, in that castle? Are they on the first floor (I know that, in Great Britain, it would be called the ground floor--I'm using the term we Americans use.) Or are they on the 2nd floor, as we in the USA would call it? Definitely appreciate any info anyone can give me on this subject! Thanks. It's probably what the British call the first floor, then, and I assume that the semi-state rooms (the three drawing rooms, etc., that are used by the Royal Family) are on that same floor. Thanks! It may do, although I'm not sure how easy it'd be to install them in such an old building. I don't remember seeing any signs of them, but I'm sure if they exist they're behind the scenes and only used for transporting heavy goods from one floor to another. First, unless the public sections of Windsor Castle are shut down for specific reasons (state banquets, etc. ), the public is allowed to tour them even when the Queen and her family are in residence. There are sections private to the Royal Family that the public cannot enter. Second--and this is what confuses me--the Crimson Drawing Room, the Green Drawing Room, the White Drawing Room, and the State Dining Room are all located along the second-floor corridor (as we would call here in America) that faces the East Terrace. That corridor, I understand, is the Queen's corridor. So if the public is allowed access to the rooms along that corridor when the Royal Family is in residence on the weekends, during Easter Court, and during the week of Royal Ascot, how can they do so without running into royals at every turn? Also, are the members of the Royal Family able to spend time on the East Terrace without running into tourists? If anyone can help me make sense of this apparent contradiction, I'll be most grateful. I'm going to reconsult some maps, but I think the private apartments are segregated from that area. It's the same corridor, I believe, but at opposite ends. If you could find a way to display a copy of that map here, I'd be most grateful. I hope the poor royals can at least walk up and down their own East Terrace corridor!! (The one facing the East Terrace, I mean.) It's not fair if their access is limited strictly to the suites in the towers. There is nothing I can find that shows the layout of the private apartments. Thanks, Warren. In regards to the State rooms, that plan certainly helps. 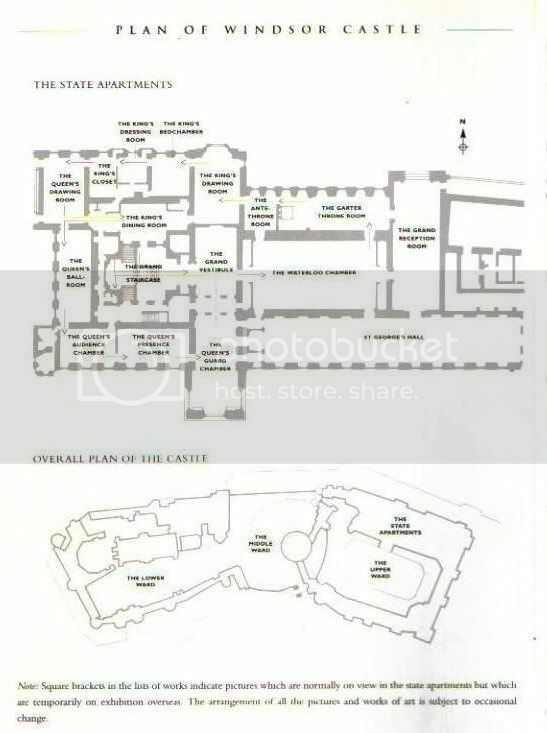 In regards to the Semi-State rooms, I don't see the State Dining Room or the White, Green, or Crimson Drawing Rooms located on that State Apartment plan, so I know they must be located in the very corridor that the Royals use that faces the East Terrace. Again, I don't see how the public can visit those rooms without running into the Royals when they're in residence. That's what I'm trying to resolve in my own mind. One other thing. I didn't see the castle library on that plan, so it must be to the left or the right of the state apartment section. Am I right in assuming it's to the east of that section that's shown on the plan? Or is it elsewhere? Here is a link to a video about windsor. I've watched all three it's a really great Documantery. And does anybody know what things are to be seen at the estate? I believe royal Lodge is there and the mauseleum of Queen Victoria? Anything else that is interesting maybe? I don't remember there being elevators.The Castle is very old and has lots of back stairways...it was hard for the staff to locate the Princesses during raids in their rooms.It's the neatest, most true form of a Castle! Seen from the river approach it must be one of the most beautiful sights in the world. The Royal Lodge can not be visited. It was used by the Queenmother who died there in 2002 and it is now the Home of Prince Andrew. The Duke asks them to clear up the mess they had left, they then decide to douse it in petrol and suddenly it is the Dukes fault!